The world’s oldest democracy is going to vote soon. Two years ago, the world’s largest democracy voted. What is the difference between the two? Well, without going into the nitty-gritties of both, let’s just focus on one point: Fragmentation. In India, elections be it General, State Assembly, Municipal or Presidential are conducted by the Election Commission of India. Each state has a Chief Electoral Office [CEO] who is repsonsible for voter enrollment, candidate declarations, etc. While each state has a different way of getting the Enrollment done [Karnataka enabled Voters to submit scanned copies of their documents and fill the form online, as far back as 2013], the Election Process is Uniform across India. In the United States, the system is totally different. The Constitution, under Article 1, Section 4 gives complete power to the State governments in matters relating to voting. The Federal Elections Commission oversees the election in general, enforcing term limits, disclosing campaign finance information, etc. Due to this decentralised nature, each state has its own method of conducting elections. Some states may use Electronic Voting Machines, so may use Ballot Papers, etc. This may result in some anomaly. The Butterfly Ballot issue of Palm Beach County Florida [explained here in the American Political Science Review] is one such example. Reconstruction of the Butterfly Ballot Paper from Palm Beach County Florida in 2000. Image copyright Gzuckier, CC-BY-SA 3.0 Unported, Wikimedia Commons. In places where Electronic Voting is followed, the voter has to fill up an optically-readible ballot paper which is then fed into a machine. In India, a standard uniform system is following using the Electronic Voting Machines developed by Bharat Electronics Limited and the Electronics Corporation of India Limited. Now, while diversity is a good thing, for it results in better quality of products and services, fragmentation is not really that good in reality. Now that we understand the issues relating to a fragmented system, let us come back to Indian Transport. Transport in India is largely a fragmented segment. Excluding aviation, which is governed by central policies and is full of private players, and the Indian Railways network, let us focus on the Buses and their operations. Depending on which part of India you are in, the bus you board would be operated by either the State Government or the Municipal Corporation. The exception is Chandigarh, where the CTU comes under the Union Territory Administration, and in the absence of a Legislative Body like in Delhi or Puducherry, it comes under the Union Government. But it is not this fragmentation that I am talking about. This is due to the various levels of decentralisation that is prevalent across our country. The fragmentation that I am talking about is what is prevalent within a single Transco, or a single City division/SPV of a State level Transco. BEST is among the most defragmented Transcos. Every bus used the same ticket machine, every conductor issues the same kind of ticket and every bus or conductor accepts a Smart Card, be it a Pass or a Prepaid Card. The fragmentation arises in matters such as the LED display: Some buses have a full length LED display on the front, some have the tiny one visible in new buses, and irrespective of whether these are functional or not, some still use the old Rolling Cloth system for displaying the route and number. In the case of BMTC, fragmentation is higher. Not all buses are properly hooked on to the Tracking platform, some buses still use the old Quantum Aeon ticket machines or worse, some still issue the old punched tickets. Simmilarly, NMMT shows some amount of fragmentation. While earlier, only AC services had Electronic ticketing, now, all have it. But, only AC bus tickets can be booked using an app, while others still have to go through the machine. Delhi too, is a good example of fragmentation. While regular buses, Cluster Buses and the Blueline buses are all operated by different entities, they essentially operate on the same route. However, buses operated by the DTC still use manual fare collection, with a handful of ticket machines thrown in for good measure in the last few months. The Cluster buses operated by the DIMTS have ticketing machines, can be tracked online, but there is compatibility of their systems with the DTC ticketing process. Blueline/Metro Feeder and other private buses, don’t have any form of connected ticketing. Now, this brings us to an important point. Common mobility. The Government of India had rolled out the More Card in 2012 as a common mobility card. Initially restricted to the Delhi Metro and Route 56 of the DMRC Feeder Bus, it was launched post the failure of the Go Mumbai Smart Card. While Mumbai has gone ahead with its Smart Card System, although extremely fragmented [one card each for BEST, Metro, Monorail and the Suburban Rail], it has managed to make cashless travel in almost all forms of transit. Autos and taxis are not covered, although Ahmedabad has gone ahead with such a proposal. I haven’t seen the More Card anywhere in Delhi in the last two years, and I have seen all Metro Feeder buses issue regular paper tickets. In 2015, the Ministry of Urban Development came up with another proposal for a National Common Mobility platform with collaboration from the National Informatics Centre [NIC], Centre For Development of Advanced Computing [C-DAC], Bureau of Indian Standards [BIS], and the National Payments Corporation of India [NPCI]. The new system is proposed to use Europay, MasterCard and Visa [EMV] Open Loop system with a stored value system. It also took into account the deficiencies with cards in Singapore. It took the Octopus Card from Hong Kong as a base for its working, in order to support Passes as well; a crucial feature of BEST’s RFID Cards. While C-DAC will develop standards for existing Metro Rail systems, the problem will arise with other modes of transport. Ferries in India don’t use eTicketing. They still use the old fashioned ticketing. Barring Mumbai and Kerala, no other area of India has a proper water transit system or anything resembling one in place. Similarly, with Tolls, will this be accepted at toll plazas operated by other bodies except the National Highways Authority of India [NHAI]? Will it be compatible with FASTag? With each Transco using different ticketing machines [BEST uses Balaji, BMTC uses Verifone, both supplied by Trimax], will the entire system be compatible with each other? Further, with vehicle tracking. A National Mobility platform will require the Vehicle Tracking System in place. BEST uses a GPS device fitted onto a bus, BMTC and DIMTS use the location from the ticketing machines. All this results in a jumble that nobody would seem to understand. Let us hope that provisions are made to ensure backward compatibility of systems so that money is not wasted in procuring new technology. Moral of the story: The odds of Hillary Clinton or Donald Trump winning are the same as the odds of getting into a BMTC bus and getting either a printed ticket, or the regular ticket. Impromptu Post Alert: I’m going to try and explain where my fascination for buses comes from. It all dates back to 1998. I believe I had mentioned this on the second blog post where I spoke about why Bus No. 56 meant to much to me. This pretty much predates that. I spent my early days growing up in in Madras, known to most people as Chennai, where buses have an interesting story of their own. Earlier operated by the Pallavan Transport Corporation, and since renamed to the Metropolitan Transport Corporation, these buses [originally green in colour] enjoyed a notorious infamy similar to Delhi’s Blueline buses. They had a nickname too: Pallavan Kollavan, which literally means Killer Pallavan. My first encounter with a Pallavan bus was aroun 1997 when a bus drove off the bridge over the Adayar River at Ekkaduthangal and landed on the older bridge below. For some strange reason, this incident remained on my mind for weeks. Fast forward to 1998, shift to Bombay, also known as Mumbai. The city that I today consider my home. I had been to Bombay back in 1996, but it was when I shifted in 1998 that things started falling into place. Staying in Vashi, the first thing that was done was to find a school to get into. The school we found, was in Santacruz. Thus, my first trip in a BEST bus, a 505 Ltd from Vashi to Bandra occurred. A BEST Bus No. 505Ltd of the Bandra Depot heading from Bandra Bus Station to CBD Belapur in its current avatar, with a scrolling LED display. Image copyright Srikanth Ramakrishnan, CC-BY-SA 4.0 International, available on the Wikimedia Commons. Slowly, as I grew up, trips by buses increased. First, it was the school bus. Since we had multiple school buses going to the same destination, with different routes, several of my fellow bus mates started having mock rivalries with students in different buses. It became a matter of prestige when our bus reached before the other one. Slowly, I started taking BEST buses when I missed the school bus, or had to come back late. I used to take BEST buses for various classes and my attachment to them began. Of course, living in Bombay meant that there would be an extra attachment to BEST because there were proper marked bus stops, both shelters and unipoles everywhere. This slowly escalated to a point where I preferred my 56 to the school bus. I used stuff all the tickets [then and now considered a Collectors item] in my backpack. I was once caught by a Ticket Checker and he went thru around 300 tickets in my bag looking for the right one. I’ve never had such a collectors fetish for any other city’s tickets. Come 2008, and a shift to Bangalore. I have to take a bus home from college. I discover that the city’s buses were [and still are] lacking in many ways. No direct buses home! I had to switch buses for a 5km distance. This acute badly managed set of buses got me interested in how to fix the issues. I wrote numerous times to the BMTC and then Transport Minister R Ashok. I posted on Facebook, and Skyscrapercity. Not that it made much of a difference though. I had a box of BMTC tickets, and unlike BEST, had no special attachment to them. I decided to build a model plane [curiously named the Flightplane Vajra after BMTC’s Vajra buses from where most of the tickets originated]. I designed the template with a regular sheet of paper, and thickened it with layers of bus tickets. Of course, the plane never did get built, its fuselage and wings are lying in different sections of my cupboard, mainly because I abandoned my Engineering dreams to take up a BSc. In 2009, I came to the conclusion that buses were the future of Transport. I badgered anyone around me who was willing to listen. It was the year I made my first long-distance bus trip from Bangalore to Bombay, one that was to occur frequently in the years to come. I just hunted around looking for validation for my theory. I thought I was right when Mercedes Benz launched their buses, but it fizzled out. Later on, Scania’s entry and its presently strong market share have proven me correct. The biggest validation I did receive, however, was in 2016, when R Jagannathan of Swarajya wrote an article titled Why The Future Of Urban Transport Is The Bus, And Not Necessarily The Metro. I lurk around Swarajya too, writing on transport and urban affairs. Post Bangalore, I moved to Coimbatore. I took to buses again. I traveled around the city, the suburbs, nearby districts, exploring towns, villages, rivers, farmlands, temples, etc. During Republic Day 2013, I traveled 350km by bus to Ulundurpet and Villupuram to take a photograph of two Toll Plazas. I made a few trips to Ahmedabad in this period where I got addicted to traveling by the Janmarg. Being my first BRTS experience, it had a profound impact on me. Then came the next move to Pune. Along with Pune, came a few trips to Dehradun, Delhi and Gurgaon. I made full use this time, with complete travel across all cities, taking as many buses as possible. The Pimpri-Chinchwad BRTS has a special connection to me. By 2015, I had decided that I *just had to* start writing about buses somewhere. Starting a blog seemed to be the most apt thing to do, and thus, I did. You learn the city. I don’t look at a city by its stores, malls and cafes. I look at it for its topography, its layout, the culture of each locality. Buy a Daily Pass, board a bus and just scoot off! Take a camera or a phone, and click random photographs while traveling. You learn a lot of interesting stuff. I learnt Kannada and Marathi thanks to buses. I went from knowing just Aai Kuthe [Where is your mother] to Bus kramank 56 ghe, ani Khar dandachya bus stop utara [Take Bus 56 and get down at Khar Danda bus stop. I know my Marathi is still weak]. So, that’s the story behind my bus-mania! Geetzy, who although doesn’t take a bus, encourages me to remain positive. To put it in perspective, don’t fret in traffic. You are in a bus with a Pass, not in an Uber, paying by the minute. Nidhi, who till date is the only person who has understood my craze, and has bought a pass to accompany me in a bus with her camera. Sammy, who clicked a photo of a bus when I badgered him to do so. So go ahead, share my craze among your friends. We all have a passion or obsession. What’s yours? I am taking my Alexa rank to the next level with Blogchatter. Current rank: 696991 globally and 59804 in India. Saving the BEST, a wonderful article by Rajendra Aklekar, journalist and author of the highly acclaimed book ‘Halt Station India’, appeared on Sunday’s edition of The Hindu. I’m going to attempt to reinterpret his article with a little bit of my own thoughts in the process. Mumbai has traditionally been dependent on its railway lines for commuting. This dependency has been justified by their reach, optimal efficiency, and reliability. This makes them more than just a Rail Network. It makes it a lifeline, because it brings together the entire Mumbai Metropolitan Region. The story with the road is similar. BEST buses have been on the roads for quite a while now. Motor Buses were to make their first appearance in 1913, operated by the Bombay Electricity Supply and Tramways Company Limited [BES &T Co. Ltd] which was set up in 1907, but didn’t turn up till 1926 because of World War I. Prior to this, the Bombay Tramway Company Limited operated horse-drawn trams in Bombay from 1873 with Electric Trams appearing on the scene in 1906 after BES&T took over the BTC. Today, BEST’s ubiquitious red buses form the last mile [or kilometre] connectivity for millions of passengers from both the city itself, as well as its suburbs and satellite towns. However, things are changing. BEST is already in knee-deep trouble, getting passengers, especially for its lacklusture AC services that have been beaten by NMMT and TMT, although BEST is seemingly gaining a steady foothold after the recent fare revision. Further, app-based aggregators, including Ola, Uber, ZipGo, Shuttl, rBus, are all eating into BESTs revenue. To add to this, the Mumbai Metropolitan Regional Transport Authority [MMRTA] is now allowing private buses to ply point to point within the city without a permit. The fault here lies in not only the competition, but also BEST. Corruption, Politics, Unions, all have made the Red Bus seemingly irrelevant in today’s life. To put it in figures, BESTs Transport Deficit is -₹858.02crore. Its Electricity Surplus of ₹925.41crore is what is keeping it floating, along with some cash flowing in from the MCGM. While it common to understand that Public Transport, being considered Public Service is bound to go thru losses, why are BESTs coffers in such a precarious state? As Mr. Aklekar puts it, it all has to do with the management of BEST. It has an Administrative Wing and a Committee that is a Political Body. The two often overstep their boundaries, since it is blurred, and cause skirmishes, which leads to losses. Along with this, it is also BESTs lack of keeping pace. NMMT and TMT went the BMTC way by procuring high-end Volvo buses while BEST remained with their scam-tainted Punjab-made Cerita fleet that were procured under the name of ‘Kinglong’ buses. This, along with the fact that BEST had abysmally high fares for their dilapidated buses just made things worse. BEST’s ITS was a total failure, because it required users to send an SMS and was full of bugs. Later on, it got shut down. Of course, let us not forget BEST’s tryst with Electronic Ticketing, which for a Municipal Level Transco, is a commendable effort, one worthy of a case study. While BEST doesn’t provide WiFi on buses, something the Mumbai Metro does, I have seen a bus with a White Box behind the Driver saying WiFi. Maybe this was a one-off trial. While Mr. Aklekar points out that BEST didn’t have a public time-table, I did find out that BEST did indeed have one, visible on its website when searching for a route, and also visible on the Mobile app m-Indicator. Of course, the increased traffic on the city’s roads have practically rendered timetables useless. Last September, the day after Anant Chaturdashi, I ended up catching the 9.30 AS4 from NSCI to Backbay at 10.15 thanks to the traffic. When Delhi can track its Cluster buses and Autos, why can’t BEST? 3500 buses aren’t hard to track. BEST can set up a system on a Public-Private Partnership and licence its API for others to use if they’re unable to give it out for free. He also talks of bus stops using electricity for advertising. The power can also be used to light it up for the safety of commuters, as well as a Public Information system for arrivals. I believe this should be easy, atleast within town limits, given that BEST supplies power there. BEST can also explore the possibility of solar powered bus stops. Why can’t BEST go the Ola-Uber way and tap into the Google Maps API to show where a bus is? Get an app, track buses, guide commuters to the nearest bus stop. Let them buy a ticket with the app! Paper tickets are great. Make them greater. Print some ads on them. BEST used to do so with their earlier punched tickets. Why not now? Print a WiFi password on it as well, so that commuters with a ticket can use it. Passholders can probably have it using an app! While I had earlier stated that I would be favour of participation from the private sector to keep the city’s transport in shape, the case with BEST is peculiar. The decentralised nature of the Mumbai Metropolitan Region allows each Municipal Corporation to run their own buses. Why can’t BEST, NMMT and TMT coordinate their bus services? Why do they have their toxic competition? BEST represents the city of Mumbai in many ways. It is a Heritage structure in itself. If not for anything else, BEST, its red buses, their bell pulls, the Double Deckers, makes the Undertaking unique in India. Even the Purple Faeries make them unique. BEST needs to get its act together. Or else India’s Oldest Transport Body, a crucial part of Mumbai’s Heritage, Culture and History would be lost to the annals of time. Click here to read Rajendra Aklekar’s article Saving the BEST. The #MakeInIndia week at Mumbai has been quite an eventful one. A lot has been learned here, and I have understood a lot about various things. Barring an unfortunate incident involving a fire at the Maharashtra Night cultural program at Girgaum Chowpatty, the event has been a largely successful one. Amitabh Kant, Secretary of Industrial Policy and Promotion stressed on the need to not only Manufacture in India, but also Invent, Innovate and Design in India. Scania and Volvo had got their new buses. The Scania was the same bus that had been given to the Nagpur Mahanagar Parivahan Limited. It is India’s first bio-fuel bus, and it’s components are mostly sourced from India itself. The Volvo was a Hybrid B7RLE/8400 model that NMMT had ordered. Of course, this does mean that BEST’s AC services are going to take a hit, but that is a different story altogether. Ministers and industrialists spoke about road connectivity, rail connectivity, and inland water transport. While the former two were with regard to connecting ports, the latter was to decongest ports and roads. Now, if one can equate Passenger and Cargo traffic, you could come to the conclusion that a set-up for Freight should ideally work for a Set-up for Passengers as well, with minor modifications. This needs to be explored big time. The ship-building industry has a vast potential in India, and this needs to be explored big time by major cities, especially Mumbai, Surat, Chennai, Kolkata, and Mangalore. Connecting Ports to Hinterland with Rail, Road, and Inland Waterways will be a big boon for people living in the vicinity. It will encourage healthy competition [not the BEST vs NMMT kind, which is toxic] among different modes, and boost trade and productivity. Amitabh Kant stressed on the need to manufacture more in India. While Services may form bulk of our economy, manufacturing is a must for it to be sustainable. This works in case of transport too. Buses need to be manufactured, trains need to be manufactured. With FDI is the rail sector, especially, high-speed rail, things are certainly set to change. He also mentioned that “Good quality Frugal Eningeering and Smartness must be combined to develop an Indian ability to manufacture”, which is true. One cannot directly apply global standards to India. India has different constraints, as well as requirements, and this must be taken care of. Overall, I was part of several brilliant sessions, with various ministers, as well as Industrialists being part of there. I also, saw a lot of the exhibitions in vicinity. The fire that broke out at the Stage during the Maharashtra Night cultural programme at Girgaum Chowpatti was a rather unfortunate one. It was a stray firework and of course, the event company must be penalised. It was an unfortunate event and the ever-awesome Mumbai Fire Brigade rushed to the spot in no time and had the fire under control with no casualties. Chief Minister Devendra Fadnavis himself stayed back till the end of the rescue operation to ensure that all had been led to safety. What peeves me off is that while not only did political parties try and gain political mileage out of this, but certain people went to the extent of calling it “Fake In India”, mocking the entire event, and making fun of a calamity, by way of which, they insulted the work done by the Firemen, as well as the Organisers of the entire event [not just the Cultural Programme]. Auto-Walas chose the wrong week to strike. Auto drivers across the city decided to strike on Monday 15th February in a protest against cab aggregators and illegal buses in the city as well as raised fares for issuing auto permits. However, BEST saved the day. BEST ran close to 90 extra services, ferrying 12 million people more on that day than the previous, and earning ₹5.2crore, which is ₹73lakh more than normal on that single day. However, BEST should have been running extra services to BKC, both Double-Deckers as well as special AC buses on that day, keeping the Make In India program in mind. Along with this, AC services should have been running on an hourly basis in and around BKC for the week. The strike didn’t impact NMMT or TMT much however, as it was within Mumbai city limits. Nagpur Mahanagar Parivahan Limited [NMPL]’s Scania biofuel bus. Image copyright Srikanth Ramakrishnan, CC-BY-SA 4.0 International, available on the Wikimedia Commons. The Scania Citybus that NMPL recieved in 2014 was present. The bus runs on an Ethanol based blend and is both eco-friendly as well as fuel efficient. The bus went to Nagpur because the Minister of Road Transport and Highways, Nitin Gadkari hails from Nagpur. One hopes that with MSRTC inducting Scanias into its fleet, BEST too would get this. NMMT’s Volvo Hybrid Bus. Image Copyright Srikanth Ramakrishnan, CC BY SA 4.0 International, available on the Wikimedia Commons. The new Volvo Hybrid bus that has been launched on the 8400 platform was on display. NMMT has purchased 5 of these buses that run on Diesel-CNG and this is definitely going to take a toll on BEST. An airconditioned minivan built by Force Motors. Image copyright Srikanth Ramakrishnan, CC BY SA 4.0 International, available on the Wikimedia Commons. Force Motors had on display, a minivan. This minivan seemed very comfortable, and reasonable luxurious. Personally, I believe it can be used as a Feeder service to the Metro. Bajaj Qute. Image copyright Srikanth Ramakrishnan, CC BY SA 4.0 International, available on the Wikimedia Commons. Bajaj’s Quadricycle, the Qute was also present there. The Qute can actually be used as an alternative for auto-rickshaws, or maybe be the Kaali-Peeli vs Cool Cab type. BEML 205 Ton Dumper. Image copyright Srikanth Ramakrishnan, CC BY SA 4.0 International, available on the Wikimedia Commons. The mammoth 205-ton dumper that Bharat Earth Movers Limited [BEML] built for mining purposes was also there. In the food court, Falafels was using a Balaji Ticketing machine that Trimax uses for BEST and MSRTC. True design unlocks better thinking, better insights, better products & better humans. Design should be used for promoting & leveraging towards sustainable growth for one and all. Design is important in manufacturing & improving products. India will be providing solutions. to 6-7 billion people in the world with design. Challenge is to make urbanization sustainable. Compact cities, connectivity, sanitation, safety depends on design & innovation. India must be ready for smart, frugal innovation. Overall, #MakeInIndia week was brilliant. It was a brilliant experience, and one that would last a lifetime. I’m a freelance Digital Media Marketing consultant. I was hired to cover the #MakeInIndia week on Social Media, and prior to this, I was part of CII’s Partnership Summit in Visakhapatnam in January 2016. Should you want to engage with me and my associates, please drop in a line at bestpedia[at]gmail[dot]com. If you are sharing this post on Twitter, please do consider Retweeting the tweet below; it was RT’ed by Amitabh Kant himself. Mumbai. Bombay. Bambai. The City that Never Sleeps. Maximum City. Or, as I like to call it, BEST City. The city of Mumbai, along with its satellite townships of Thane, Navi Mumbai, Mira-Bhayander, Vasai-Virar, and Kalyan-Dombivali forms the Mumbai Metropolitan Region, which is India’s second largest urban agglomeration and largest conurbation in a single state in the country. Other major Metropolitan regions in the country include the Tricity area of the Union Territory of Chandigarh, Mohali in Punjab and Panchkula in Haryana, and the National Capital Region consisting of the National Capital Territory of Delhi, Gurgaon, Faridabad, NOIDA, Ghaziabad, etc. Neither of these two is in a single state unlike the MMR. However, what makes the MMR unique is the variety that is present across one single state. Maharashtra, being the state with the most decentralised administration, doesn’t control the MMR as much as the local Municipal bodies do. Each Municipal Body controls Transport in its jurisdiction, along with other factors such as water supply, electricity supply etc. So what maketh Mumbai #MadeOfGreat ??? Roads. Rail. Buses. Beaches. Add to it, we have India’s first open-to-sea Cable-stayed bridge and also are the proud starting point of India’s first Expressway. So, now, let us go into the nitty-gritties of what makes Mumbai the most amazing city. Western Express Highway, Mumbai. Image copyright Nicholas, CC-BY-SA 3.0 Unported, available at Wikimedia Commons. Mumbai offers some amazing roads for you to take out your Tata, Toyota, Maruti, and Mercedes. You have the Western Express Highway, Eastern Express Highway, Sion Panvel Highway for your car to stretch its tyres. If you want the scenic route, you have Marine Drive, the Worli Seaface, Bandra Worli Sea Link, Eastern Freeway, Palm Beach Marg, and more. Of course, you do have the Toll Plazas, but if you have a FASTag, you can zip thru with ease. If this wasn’t enough, the city is the only one in India to feature a Road tunnel WITHIN the city! Mumbai also happens to be the city with maximum disciplined traffic. You’ll see people drive neatly in lanes, and give preference to pedestrians. The city also has long Skywalks, mostly connecting Railway stations to other areas, allowing Pedestrians to walk without having to put up with traffic. Mumbai is probably India’s ONLY Linear city. The core city is divided into two parts, the Island City also known as Town, and the Suburbs, known as Greater Mumbai. Autos are prohibited in Town, which also houses some of Mumbai’s longest flyovers. Dr. Ambedkar Marg, the southern extension of the Eastern Express Highway features the 2.9km Lalbaugh flyover at Parel, which was built higher than most flyovers to allow the procession of the Lalbughcha Raja during Ganesh Chaturthi. The 2.4km long JJ Road flyover at Byculla was among the first in the country to use Noise barriers. The suburbs have the two main highways, along with SV Road, LBS Marg and numerous link roads such as the Jogeshwari Vikhroli Link Road, and the Santacruz Chembur Link Road, which features the city’s first Double Decker flyover. Navi Mumbai, India’s most amazing planned city was built in the 1970s by the City and Industrial Development Corporation [CIDCO] to decongest Mumbai. It is a planned city, stretching from Airoli in the North to Panvel in the south. It was planned and designed by Charles Correa, and features some amazing railway stations. Vashi station has an IT Park above the tracks, CBD Belapur station has a helipad atop it, and Turbhe Railway station was designed by Hafeez Contractor. Flyovers in Mumbai feature public paid parking lots below them, or house Traffic Police Stations. The Khodadad Circle flyover, at Dadar Tram Terminus houses a Bus terminus under it. MSRTC’s conductorless Shivneri buses to Pune leave from here. Transport aside, Mumbai features a lot of amenities and interesting facilities for the humans residing there. It houses two cricket stadiums, Wankhede and Brabourne, a football stadium at Cooperage for all the future Messi’s, and a large Indoor stadium at the National Sports Club of India [NSCI]. It features numerous cultural establishments such as the Chhatrapati Shivaji Vastu Sangrahalay, Bhau Da Ji Lad Museum, Jehangir Art Gallery and National Centre for Performing Arts. Mumbai is home to India’s densest railway network. Comprising 465km of suburban lines, it is spread out across 6 lines. The city has India’s oldest railway network, and the maximum number of Terminus Railway stations. 2342 daily services from 4am to 1am carry approximately 7.5million passengers in a Day! Each train consists of Second Class, First Class, Women’s Second and First class coaches. Mumbai has a combination of trains, some with 9 coaches, some with 12 and some with 15! Air conditioned coaches will be inducted by 2016. Mumbai is the head of two railway zones, Western and Central and houses India’s most magnificent railway terminus, the Chhatrapati Shivaji Terminus, which is a UNESCO World Heritage structure. It is also the only city that has two Rajdhani Expresses connecting it to Delhi. Mumbai Suburban Railway. Image copyright Integral Coach Factory, CC-BY-SA 3.0 Unported, available on Wikimedia Commons. Mumbai has India’s oldest Public Transport system, in the form of BEST, which has been operational since 1873. It is right to say that Mumbai had Public Transport when the rest of India did not know what Transport meant. The BEST provides buses that connect to all other parts of the city and most of the metropolis. BEST is today, the only Transco apart from the Kerala State Road Transport Corporation that operates Double Decker buses, and makes use of the Bell Pull on all its non AC fleet. BEST is also the only transco to feature a single-door Volvo B7RLE. BEST Bus No. 56 at Versova Yari Road Bus Station. Image copyright Srikanth Ramakrishnan, CC-BY-SA 4.0 International, available on the Wikimedia Commons. Mumbai also has India’s oldest airport at Juhu as well as the second largest airport in the country, that also has the current tallest Air Traffic Control tower. Again, the city had air transport when the rest of India wanted to know how planes fly. It was from here that JRD Tata first flew in 1932, four years after it opened. Mumbai Airport as seen from above. Image copyright Andrew Thomas, CC-BY-SA 2.0 Generic, available on the Wikimedia Commons. India’s first expressway connecting Mumbai and Pune starts from Panvel, while the Eastern Freeway, and Sion Panvel Expressway offer great drives and greater escape routes in the city. Tata Motors has signed up Lionel Messi as its brand ambassador and I think that is a great move! The Mayor looked at the proposal sent in by the citizen group. This was what he had been waiting for ever since he had been sworn in. He held a proposal sent in by the citizen group with a detailed action plan to set up a municipal bus service in the town. He quickly sent a copy of it to the Municipal Commissioner for his approval, as well as to the Minister. He knew this was the one thing that the town needed at that moment to get the attention of the local politicians who had been ignoring the town for years. This was the only town in the state that was a District Headquarters but did not have a Bus Service. The proposal was to purchase five minibuses and hire another ten to run them on ten routes. One of the citizens, a 70 year old War Veteran, had suggested buying five of them first so that the town could keep them forever, on a sentimental basis. The Mayor added his proposal to set up 50 Bus Shelters in the town with advertisements on them to earn some much needed Revenue. The Municipal Commissioner, who had been appointed a year ago, the same time the Mayor got appointed, was upset that the town was ignored, and thus felt bored most of the time as there was no work to do. It was therefore, but natural for him to feel elated when this proposal was received, for it meant he’d finally have some work to do in this small but bustling town. The Commissioner sent the signed proposal up to the Minister. He had a plan to get the Minister to accept the proposal without a fuss. The Minister had agreed to meet him for half an hour to discuss the proposal. He walked into her office and sat down. “I see. I trust, you won’t be bothering me or the State Government once I sign this proposal?”, she asked. “No ma’am. We just need your approval to set up the board, the undertaking and give us complete autonomy over the entire operation, so that we won’t have to disturb you again.” He wanted to add that he had drafted the document in such a way that the State would also not be able to interfere in the Transport body once it was set up, but he refrained from saying so, as he didn’t want to antagonise her at this stage. “Yes ma’am”, he said, saluting as he left. He walked out of her room and ran out to the parking lot, where a car was waiting to take him back to town. He couldn’t wait to get back and hand over the signed deed to the Mayor and Council. He reached his office and immediately asked for the Mayor to call for a Council meeting. The Mayor immediately introduced his bill which the Council passed unanimously. The bill referred to the deed that was signed by the Minister, and once passed, the Council set up an ad-hoc Transport Board with three Councillors, the Mayor and the Commissioner. The Transport Board called for their first meeting an hour later where they decided to discuss three things. The first, was the composition of the permanent board. The bill passed in the Council mandated a seven member panel with three Councillors, three citizens and the Municipal Commissioner. The Mayor and Deputy Mayor would act as Observers, but would get to weigh in and no decision by the board would be valid without the signature of the Mayor. The board agreed to induct two senior councilors who had earlier lived in bigger cities due to their experience, one of the two ad-hoc Board members from the Council as half of the Board. The citizens side was to be represented by two Retired Army Officers, both of whom had experience dealing with bureaucrats, and the wife of the Commissioner of Police. Once this was done, they decided to proceed with the next item on the agenda: Shortlisting manufacturers for the buses to be purchased and hired. This was easier said than done. A week prior to this, the Municipality had invited bids from several Manufacturers for Minibuses. All of them eagerly came forward with fancy buses. After agreeing that they needed a basic, no-frills, but fuel efficient non-airconditioned bus, they zeroed in on one model. The Commissioner sent his deputy to inform the bidders that the process was over and that the winning manufacturer would receive the order in a day. The Municipality had also invited bids for hiring buses, and decided to go with the cheapest offer. With two hurdles out of the way, the Board now had only one major item in their agenda. They needed to find drivers. The Mayor suggested that they hire drivers and conductors along with the buses, and find a permanent solution for the purchased buses. The Commissioner agreed, and decided that the Transport Undertaking that had been formed would formally put out advertisements the next day. With the main problems sorted, the meeting was adjourned, and the Mayor posted the minutes of the meeting on the Noticeboard outside the Town Hall. That night while eating dinner, the Mayor was going thru the documents prepared earlier in the day and realised that there were three things to be done. He called up the Commissioner and told him that they needed to build a depot, set up a system for tickets, and set up bus stops. The next day, the newly formed Transport Board called for a meeting with full strength. The Commissioner tabled the Mayor’s recommendations and the agenda was set. The Municipality had a barren plot of land at one end of the town where the new four lane highway connecting the town to the State Capital was to end. The State Transport body was planning to shift the ST terminus there as well. The Board agreed that this plot would be fenced and divided into two, one for the depot and one for the bus station. Once funds started flowing in, a proper bus station would be built. The Board agreed to name the body ‘Jump Around Town’ and on the suggestion of the Deputy Mayor, decided to invite bids from advertisers to set up Bus Stops with hoardings across the town. A local Printing Press was given a contract to print 25,000 tickets of different denominations and the board set up a fare slab. A week had passed after the Board Meeting. A bank account for Just Across Town – JAT, had been created where all the Councillors had deposited the money they had pledged. The Manufacturer had said that buses would be delivered in a week as they were quite popular among government agencies. The Printing Press had delivered the entire set of tickets to the Municipality. Twenty drivers and conductors, as well as five depot managers had been hired on a permanent basis. Ten buses had been hired, and ready to be put in service. The board had decided to put up advertisements on the bodies as well as the inside of each bus. Several advertisers had come forward and one was selected. One advertiser had set up 20 bus stops around town and signed a deal to pay 10% of the income to JAT. The land for the depot had been leveled, concreted, and a wall erected all around it, as well dividing it into two. The depot was given an office block as well as a resting area for staff, build using Ready to Assemble components. The Bus Station was given a proper shelter, washrooms, platforms and benches, with a huge signboard proclaiming: CENTRAL BUS STATION. The Board announced that there would be free transport on the day of inauguration. On the suggestion of one of the Board Members, a few thousand Daily Passes, and Monthly Passes were also printed. Each conductor was given a ticket punch, and each bus was fitted with a bell-pull. With 20 bus stops in place from the Advertiser, the board had allocated funds from their Corpus to set up another 50 bus stops across the city, and leased it out to advertisers, thus earning a lot more. A pay-to-use car park was built across the street from the Bus Station which was made operational that morning. Shops were set up inside the parking and the bus station and rented out to several traders.The Mayor and the Commissioner had thought of everything humanly possible that was left to be done before services commenced. The inauguration ceremony was simple. The Mayor made a short speech about JAT, and the Commissioner made a quick intro to what the Undertaking’s setup looked like. Once this was done, they unveiled a special collectible Medallion with an engraving of a bus on one side and JAT on the reverse. This was to be sold at a premium rate at the bus depot. 5,000 of them were produced in the first lot. Once done, all four buses left from the Bus Station. The townsfolk happily boarded them and took a joyride. Around a hundred Monthly Passes were sold then and there. Jump Around Town was very successful in the coming years. The number of routes went up from 4 to 56 in a year. All rented buses had been returned as JAT bought itself another 100 buses. The State Transport department stopped running its buses through the town and handed over its routes to JAT. Thanks to the new National Highway, the town began to expand in along the Highway. The National Government agreed to set up Bus Stops along the highway for JAT, while the State Government grudgingly expanded the Municipality’s limits in the newly added areas. Route 56 became the longest route operated by JAT, connecting a Refinery on the Outskirts to the Fire Station via the Central Bus Station. The Mayor and the Commissioner were happy and pleased with their work. However, the State Government was not too pleased. The Minister, who had approved the Transport Plan, deemed it illegal and unconstitutional when she realised that the State Government would not be able to meddle in its affairs. She had the Commissioner transferred to State Health Department and replaced him with another fellow, one who was loyal to her. This move did not go down well with the townsfolk or the neighbouring villages, which were also now served by JAT. Elections were around the corner. The Mayor’s party wanted him to stand as a candidate from the Town to the State Legislature. Thanks to its unpopularity, the previous government fell and the Mayor’s party pulled through with a slim majority. The Mayor himself won with an overwhelming majority and was now made the Minister of Transport with his former friend, the Commissioner assisting him as the Commissioner of Transport. They knew that good times were ahead for the state. They had five years to turnaround the fortunes of the ailing State Transport undertaking, and integrate services with the numerous local services. The future was bright. Very bright. The name Jump Around Town [JAT] was inspired by Jump Around Carson [JAC], the Municipal Transport Body in Carson City, Nevada, USA. While writing this, I felt hungry. To feed myself, I turned to Gurgaon’s best Home Cooked food at Bite Club. If you are in Gurgaon, head to BiteClub.in for some really good, tasty and healthy food. Use my Referral Code SRIK5N9N and earn yourself ₹50 in credit. If you came here from IndiBlogger, please do promote this post on IndiVine. This can be taken as a continuation of two earlier posts, BEST Limited and NMMT Limited. Recently, BEST made an announcement that it would enable users to track a BEST bus live using a phone app. Now, I am going to start by introducing BEST’s Public Information System [PIS], also known as Intelligent Transit System [ITS], that I had attempted to explain in my post on Electronic Ticket Systems. As stated earlier, each bus stop in BEST is numbered. This number is used to identify the buses that stop at that particular bus stop and is used to determine the ETA of the buses that are arriving at that stop. This number also ensures that each stop is unique and in the database, so that the conductors can enter it on their ETMs. While, there may be two or more bus stops, adjacent to each other, sharing the same name, each bus stop caters to different buses and has a different Stop Code. However, for a particular bus, only one of those stops matters and thus, there is no confusion for the conductor as well. In partnership with several firms, including Trimax IT, Verve Compusoft, Overtures Infotech, the BEST PIS is visible at its website http://bestpis.in. Each bus is fitted with a set of GPS devices that are present above the drivers’ seat. This helps coordinating the location of the bus and transmitting the location to the server. BEST 07187 as an SMS to 56060. NEHRU PLANETARIUM STOP : 003AS ETA 09:41,004AS ETA 09:41,033 ETA 09:44,305 ETA 09:48,592AS ETA 11:07,086 ETA 13:01,, Powered by Verve Compusoft Pvt. Ltd.
Of course, do note that this doesn’t mean that the next 86 is going to come after 4 hours, it merely means that the next 86 with working GPS device is that far. It could also mean the system is faulty, since it was showing an ETA of 3.42am for AS-4 last night. Now, BEST plans to integrate the existing system with a map that will show the exact position of the bus, live, on the map. While I personally feel this is a great move, BEST should also use this opportunity to ensure that all its buses are taken into consideration. This was something that started with the Jawaharlal Nehru National Urban Renewal Mission [JnNURM], now replaced with the Atal Mission for Rejuvination and Urban Transformation [AMRUT]. Under this, all buses were fitted with three exterior LED displays, one at the front of the bus, one on the side and one at the rear to display the route. While cities like Bangalore, Chennai and Mysore alternatively scrolled English and Kannada/Tamil on these displays, and Coimbatore showed only Tamil on all displays, BEST decided to have only Marathi on the front display, with English on the other two displays. A fourth LED display was present inside of the bus, behind the drivers area. This panel would display the upcoming stops, accompanied by an announcement. In most cases, they rarely work. They work in most of the older Blue-coloured JnNURM BMTC buses where they display the destination and the next stop. These systems work excellently in the Ahmedabad Janmarg as well as PMPML Rainbow. In BEST, I have experienced this only once, back in 2012, when I was in an AS-505 between Bandra Bus Station and CBD Belapur Bus Station. This system works with GPS too. However, it is nonfunctional on most BEST buses today, and needs to be revived soon. Now this may come as a surprise to many, including my fellow BEST users, because it is not a very well known system. Some people may have seen it in a few buses that are part of Backbay Depot. 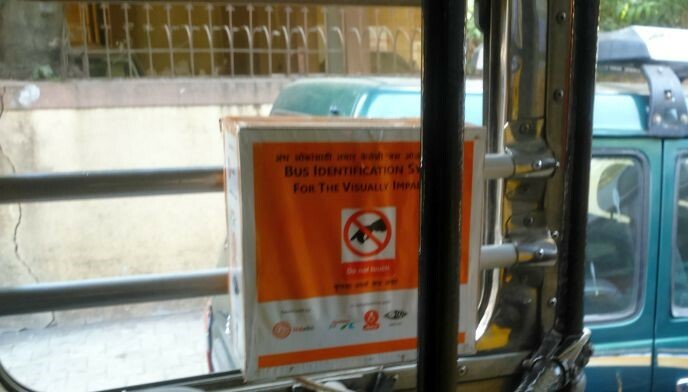 OnBoard Bus Identification System for Visually Impaired Passengers on a BEST Bus of the Backbay Depot. Image copyright Coolguyz. This device is called OnBoard, and is jointly developed by the Xavier’s Resource Centre for Visually Challenged (XRCVC), in collaboration with Assistech of IIT-Delhi. It was tested first by BEST in two buses in February-April 2015 and then tested out in DTC. From what I gather, the system requires a visually impaired person to activate a switch which then informs them of any approaching bus. The box is fitted on the window frame next to the single seat up front. I believe this has scope to connect to the existing GPS set-up in order to make it automated, so when the bus reaches a stop, it gets triggered on its own. So, imagine if someone is waiting at World Trade Centre, for Bus No. 134. A bus fitted with OnBoard arrives, detects its location, or synchronises itself with the Bus Stop [a slightly expensive, difficult to maintain, but more efficient system] and it announces to the passenger: बस क्रमांक १३४: बॉकबे आगार ते प्रबोधनकार ठाकरे उद्यान शिवडी , followed by Bus Number 134, Backbay Depot to Prabodhankar Thakre Udyan Sewree. This would be great in my opinion. This would be BESTs second attempt at trying improve accessibility for disabled passengers, with the previous one being the induction of the Ultra-Low-Floor Tata Starbus in 2004 with automatic doors and ramps for wheelchairs. At the end of the day, BEST has done a good job at trying to do what it is supposed to do: Be a Transport Undertaking that caters to the Passengers, rather than try and rake in money, which is what NMMT , TMT, and mainly the BMTC seem to be doing. BEST was among the first transcos in India to reserve seats for women, senior citizens, physically-impaired commuters, and charge visually-impaired commuters a flat fare of ₹2 [earlier ₹1]. A smarter BEST, one that is able to cater to its commuters effectively, will most certainly help in making Mumbai a smarter city. Greetings, and welcome to my new post. This post is to explain the significance of the number 56 in my life. My connection with this number started out in a mundane way, yet the significance today seems cosmic. I see 56 everywhere, including in politics, for after all, our Prime Minister has a 56-inch chest. Jokes apart, let me start at the beginning. The very beginning. The first BEST bus I have ever taken was 505Ltd. The bus that today runs between Bandra Bus Station and CBD Belapur Bus Station. This was back in 1998, I don’t quite recall where the bus terminated, but I remember we had taken it from Vashi to Bandra and then took an autorickshaw to Santacruz. Subsequently I shifted to Andheri, and with a school bus or a car around, taking a BEST was a once-in-blue-moon activity. However, if and when I did board one of them, it was invariably a 38 or a 79, then running on the Hutatma Chowk-Goregaon Depot and Gadkari Chowk-Charkop routes. Circa 2002, we shifted to a new house. We had exactly three buses then: 38, 56 and 221 [Yari Road to Andheri Station via JVPD]. I was bad at Hindi and used to dance at that time. This meant tri-weekly trips to Seven Bungalows and bi-weekly trips to Versova for classes. The former, had a common bus stop for both 56 and 221, while the latter, had separate ones. Being tired, I’d usually walk to the closer bus stop, and 56 it was. 56 was also the most reliable bus to go to school, math tuition later on, and to meet my friend. Thus, over a period of 5 years, 56 became the most used bus for me. Bus number 56 made a casual appearance in my life, in various drawings, poems, stories and what not. Circa 2008, I moved out to Bangalore. BMTC couldn’t fill the void that the lack of BEST had caused. Bad bus services, closing doors, in and out of the same doors, and horrible route planning made me dislike them strongly, but then, Volvo services helped out once in a while. Most of my trips were restricted to 365, 356 and their various sub-routes. Three years later, I was in Coimbatore. I saw 56 multiple times in a day, but it went in a different route, and I was never interested. Fast forward to 2014. I come to Pune. I make a trip to Bombay, where I see 56. Memories are relived, I am transported back to 2007. The only difference is that it no longer uses a Rolling Cloth Display but now uses a scrolling LED display. It was at that moment, that I decided to Start my Project 56. I managed to click buses number 56 operated by the PMPML, TMT and BEST. I convinced a friend to click Abu Dhabi, Madrid, and Winnipeg as well. My crazy mind decided to take PMPML 56 to Wadgaon from Shanipar. It took me through Sinhagad Road, which soon became among my favourite parts of Pune. Soon, I started travelling all the way to Versova to click a BEST 56. It took several attempts, but one day, after a polite chat with a driver, I managed to get it. A perfect click. Two months ago, I clicked the newly launched NMMT 56 between Kalamboli and Mansarovar Railway Station. I’ve been seeing 56 everywhere ever since I came to Pune. It once cost me ₹56 in an auto to meet a friend. I clicked a photograph of the Tunnel on the Dehradun-Saharanpur National Highway and the timer on the traffic signal showed me 56 seconds. I was however, upset that I couldn’t click a BMTC 56, which is very rare, or a DTC 56, which got scrapped a month before I went to Delhi. And that, is my obsession with 56.